For the next 8-10 weeks, your backyard will be overrun with staff and swimming pool construction equipment. Your backyard has now become a construction site and will look like one until the end of the process when your dream becomes a reality. This process has many moving parts and at times we will be waiting on city inspections, weather or other scheduling before work can continue. Please be patient and understand that it is not the journey but the end result. Through this process please ask your Project Manager or Sales Consultant any questions you may have. We shall acquire the permits for the construction of the pool. All plans must comply with state, local and HOA building requirements. The homeowner is required to get the HOA approval unless otherwise agreed upon. We can provide you detailed plans to submit to the HOA for approval. Be aware that some HOAs only meet once or twice a month to approve submissions so that could delay the start of your pool. 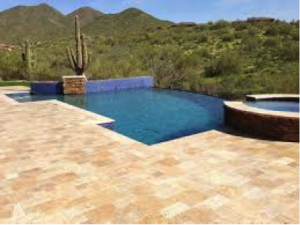 A representative from PV Pools will come to your home and lay the pool out that you approved with your Sales Consultant. 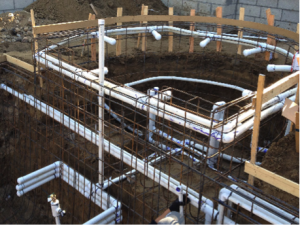 This layout will indicate the shape, size and location of your pool in your yard for the excavation crew. The excavation crew will come in with some heavy equipment within a couple days and dig the pool to the engineering plans. We will push any decorative rock to the side to gain access to the dig area but unless stated in the agreement you will be responsible for re-spreading the rock. We can not be responsible for any decorative rock, landscaping or irrigation from the front of your home to the dig site. You most likely will need to repair irrigation, replace plants and purchase additional decorative rock from the front of the home to the dig site. The term “Hard Dig” is used when the soil conditions require the crew to remove the bucket from the excavator and replace with a ripper attachment. This ripper attachment can break up hard soil but is very timely therefor excavation surcharges will occur. The amount depends on the size of your pool, depth of the harden soil and type of hardness. We will dig a test hole at the beginning of the excavation and will be able to determine at that point if you have a Hard Dig and give you the surcharge amount. 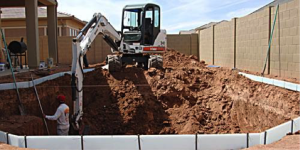 We do everything we can to avoid any excavation surcharges. The plumbing for each pool is designed specifically to give it the best circulation and filtration for crystal clear water and ease of maintenance. We perform hydraulic calculations to ensure that all equipment and piping are of the correct size to combine water clarity and energy conservation. An experienced plumber will plumb in all of the filtration equipment for the pool, including water feature pumps and other optional equipment. Structural Steel is the steel reinforcement structure for the shell of your pool to give it added strength per the engineering plans. It consist of a series of bars placed horizontally and vertically specifically engineered for you pool design requirements. The shell of your new pool is warrantied for life from any crack s or defects to the original home owner. 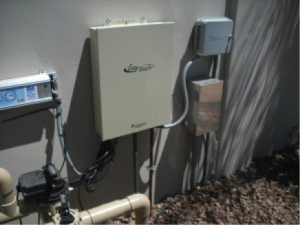 Our master electricians will trench and install electrical conduit/wire from the house main electrical box to the equipment and all other locations specified on the plan. If utilizing a gas heater or BBQ, gas lines will be run from the main gas meter in the front of the house to the designated equipment. Upon Final City Inspection the homeowner will need to contact SRP and have them connect the gas line to the main meter. Only the homeowner can call to schedule this appointment and will need to be home for the appointment to allow access to the home. This is a free service from SRP and they will most likely install a larger meter to accommodate your use. Upon completion of the electrical stage we are required to have a city inspection before we can proceed. This is the first of two city inspections and depending on the city and time of year can take a few days. 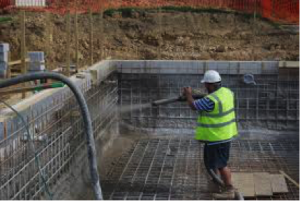 Shotcrete is concrete that is shot through a high pressure hose to create the shell of your new pool. Upon completion it is required that the homeowner lightly water the concrete 3-4 times per day to allow the concrete to cure slowly. We will then need to wait another 5-7 days before we can begin the next step to allow the concrete to cure properly. 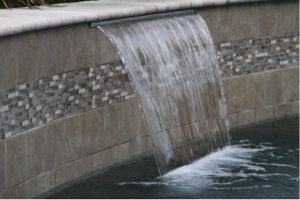 At this step we will install the waterline tile, coping around the pool edge and any water features such as waterfalls, water sheer, rain descent, deckjets, laminars, etc. The time required will depend on the number of features and their complexity. The two most popular decking options are concrete or pavers. Concrete can be coated with a texture such as Cool Deck, stamped, acid wash or many other options. Concrete decking will be poured and then the finish applied. Pavers have become the most desirable because of the beauty, longevity and maintenance free. Pavers come in brick pavers, concrete pavers and tumbled travertine. The number of square feet of decking will determine the number of days it will require. 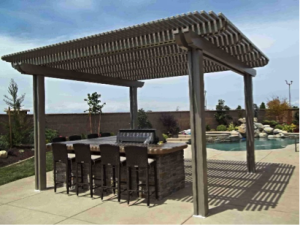 This phase encompasses the construction of outdoor living features such as outdoor kitchen/BBQ, fireplaces, sitting areas, ramadas, pergolas, etc. One of our primary goals is to “bring the indoors outside”. By creating structures that accommodate the way you live your life, your backyard can be enjoyed and utilized 365 days a year. The complexity of your project will determine the amount of time needed to complete this phase. Before we can apply the pool surface we must call in the final city inspection. The home owner will be required to be home for this inspection because the inspector will need access to the home. He will need to verify that all barrier codes to the pool area have been met. Your pool project is almost complete. The most popular finish is Pebbletech which is a finish that it shot out of a high pressure hose and comes in a variety of colors. 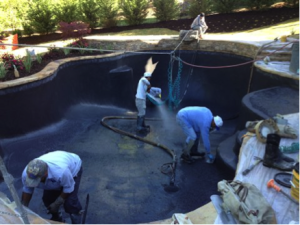 After applying the finish it requires 24 hours to cure before we come back and perform an acid wash. Once we complete the acid wash will will start to fill the pool up with water. The kids are probably ready to jump in by now! A little patience will be needed as our staff starts up all the equipment and starts to balance the water chemistry. Our start up crew is there to get the water moving as quickly as the pool can get filled so you can begin to enjoy your new pool. A technician will set up a convenient time to go over all the equipment and care instructions with you.